My first camping hammock was the Hennessy Expedition Asym. It was the hammock that converted me to staying off the ground when I went camping. However, I was often frustrated that I couldn’t keep the stock tarp taut, particularly when I got in the hammock. I could make everything look amazing and beautiful on the outside, but once I got inside, the hammock settled and the tarp went slack. Limp. Frumpy. Connecting a tarp to the hammock suspension isn’t restricted to the Hennessy Hammock models. You can tack on a tarp to any hammock so long as the suspension extends long enough to provide a connection point. 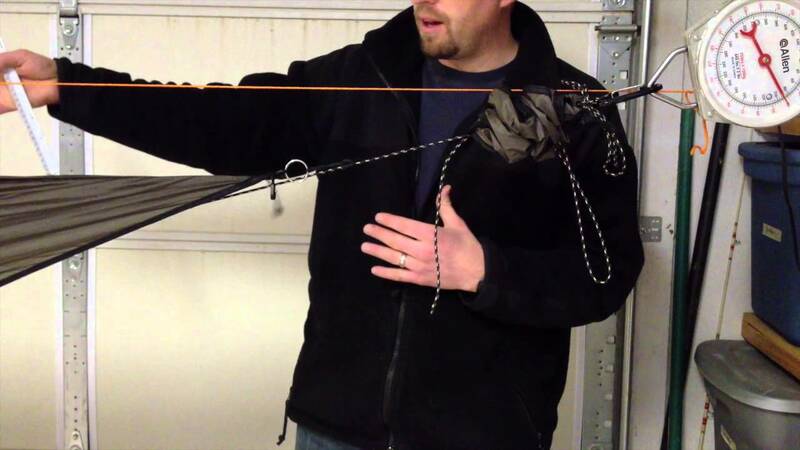 For example, you can connect a tarp to whoopie slings using a prusik knot on the non-moving side of the adjustable loop. The ‘trick’ to rigging a no-sag Hennessy Hammock tarp—to keep the tarp taut even when the hammock is loaded—is all in how you hang the hammock. Traditionally, the Hennessy is shown being pitched very tight across the anchor points. However, the tighter you pitch the hammock, the higher the horizontal “pulling” forces, which in turn, stretch the suspension components more. That stretch lengthens the suspension (a lot or a little), which changes the hypotenuse and the point where the tarp used to be, thus making it slacken. Also, if the trees on which you are hanging are small, those tighter pitches can also pull the trees in slightly, further adding slack to the tarp. Instead of pulling the suspension tight and “as level as possible”, hang the suspension at a 30° angle. This minimizes the horizontal pulling forces and minimizes the change between the original hang angle and the final angle once loaded. The tarp connection point can also placed further up the hammock suspension, which keeps the tarp taut when the hammock is loaded. I often add elastic shock cord to tension the side tie-outs of my tarp. This can help take additional slack out of a tarp (especially if it has been raining, which can stretch nylon material). This is an optional step, but it can help in some cases. But, don’t take my word for it—give it a try and tell me what you think. 🙂 My garage hammock laboratory has all the latest in stake alternatives. How does increasing the angle to 30 degrees affect the diagonal lie. It would seem to be more banana like and less flat. You need a good day so you can lay diagonal. When you lay diagonally across the bias of the fabric you lay ergonomically flat. When you try and hang a hammock right you are stuck in a cocoon with bowed shoulders and hyperextended knees and ankles. If I was using a daisy chain tree strap (I have the python straps), wouldn’t I just be able to clip in the hammock on a rung above the one I have hammock clipped into? What you are trying to achieve is to get your suspension on a 30-degree angle. In other words, from where you attach your webbing strap, the suspension should angle downwards toward your hammock. You can estimate this angle by using your hand–extend your thumb upwards to the sky and point your index finger toward your hammock. With a little weight in the hammock you can measure more accurately, but you are trying to line up the suspension by touching the tip of your thumb and the tip of your index finger to the suspension while keeping your index finger horizontal and pointing to the hammock. You can use my hammock hang calculator to estimate the anchor point but for an average distance of 15 feet, you’ll need to attach your webbing about 6 feet high. If you hang lower than that and just try to clip in to a loop closer to the tree but further up the daisy chain you’ll only tighten the suspension. You actually want to loosen it in a manner if speaking. I don’t have a HH just the old ENO and a kelty noah`s tarp. But I tried this out this afternoon. It worked great! Thanks for the best ideas! You’re welcome and thanks! Yes, this technique will work with other hammock/tarp combos if you have suspension system that applies. Great video, I’ve tried this method after using the hang calculator but find that the ridge line for the bug screen now sags causing the screen to be loose. Tim, it should work but we might be missing a detail. Give me your specs and I’ll try to work it with you. How far apart are your anchor points? Are you using a Hennessy? How big is the hammock and how long is the hammock ridge line? Okay, I’m doing a little test here. I have the same problem with my deep jungle asym zip: When the hammock is hung at a 30⁰ angle (measured with a protractor), the ridge line drops into my face and the bug net is useless. My solution was to bend about a foot of shock cord to the ridgeline near one end and tie the other end of the shock cord to the bowline with which the ridge line is anchored. It is taut enough to hold the ridge line up when the hammock is pitched with a 30⁰ angle on the suspension, yet loose enough to stretch all the way out if it is pitched with a sufficiently flat angle to pull the whole ridge line taut. I do have a diagonal fold of bug net a few inches long when hung at 30⁰ but that’s acceptable now that it gets the bug net out of my face. Ok, tried it last night, it worked great for awhile but the winds picked up around 3 AM and it ended up looking real bad this morning. I’m talking wind that makes the tarp go crazy floppy. It looked good shortly after I set up and tried it and was still looking ok when I woke up at midnight. I think I need to attach with something stronger then the factory prusik. Yes, check to see how easily they slide. I switched to Klemheist knots and they work well. Another thing that may help is to inch the tarp up a half inch or so further up the line, away from the hammock, so when unloaded the line from the prusik/Klemheist to the hammock is more slack, if that makes sense. I’m curious to hear if the winds pulled the prusik loose. I’m pretty sure it was the wind since it stayed up initially. The winds got pretty intense around 3 AM, enough to wake me up, then died down and started back just before I got up at 5:30 I think I might add the Klemheist knot and just leave the prusik as is. That way I’ll have two knots holding each end and a few feet of small rope wont add much weight. what about using some shock cord or a piece of latex tubing between the tarp and the suspension? That could work, although I haven’t tried it. You would have to pull those cords pretty tight so when the hammock was loaded it relaxes but remains taut. I’d prefer not to keep the tarp under such high tension. I’m surprised that Hennessy didn’t have an exact length for you. The bug netting is cut to fit so you don’t want the ridge line too long otherwise you risk ripping the net. The standard length is around 83% of the length of the hammock. For a 10 ft hammock that provides a ridge line of about 100 inches. This is a good average for Hennessy hammocks. Derek; What have you found to make the best ridge line to maintain the distance you desire? A hammock ridge line? I like 1.75mm amsteel. Well done – very educational. I’ll be trying this with my HH and DIY hammocks. Thank-you. Derek, I’m just getting started with the HH Expedition and just purchased the larger Hex fly to replace the smaller one that was included. If you had your druthers, would you pitch your tarp like you’ve shown here or fashion a separate ridge line like you’ve shown on your post about Using a Continuous Ridge Line? Which method do you prefer? Thanks! David, great question. There are cases for both variations, and you may find that one method works better than the other depending on the situation. Where speed, efficiency, and weight are optimal, you may want the “connected” version where the tarp is attached to the hammock suspension. With Snake Skin-style stuff sacks, the entire system works very well together. Pitching the tarp separate is particularly nice if you have a variety of tarps or hammocks that you switch between for different types of trips. For example, if you have a nice tarp but you have a “basic” hammock for winter use and a mosquito hammock for the summer. Pitching separate also gives you a few more pitching options. The best reason is what you decide — what works best for you. I’m currently really enjoying the all-in-one system because I lean towards simple, efficient systems. The big hang-up for me when I first used a Hennessy was that the tarp didn’t always cooperate. Now that I have a solution for keeping the tarp taut, I find it a very viable option. I love that the tarp is always centered over the hammock, regardless of how I hang the hammock. Thanks for your reply. I agree that I will have to test both methods and see which works best for me. You’re video also convinced me to rig my garage in some fashion so I can test setups more easily in a nice, controlled environment. I appreciate your insightful posts and very detailed instructions sheets. I’m an avid backpacker and just getting into hammock camping. I’ve been considering the Hennesy Expedition as my starter hammock. Thanks for the video, this is great stuff! Just a quick comment on the anchor point load (see comment at 5:35 in the video) that may not mean anything to anyone but me. For a 40 lb weight centered in between the two anchor points, an 8˚ hang angle should create about 140 lbs of tension in the cable. The 90 lbs mentioned here correlates more to a hang angle between 12 and 13˚. Nerd explanation. Maybe this is useful for people who carry calculators in the woods and want to know how much tension is in their hammocks as they set up. Each anchor point shares half the 40 lb load (20 pounds each). You can calculate the tension in the cable using geometry and balancing the upward force from the anchor and the downward force from the hammock. Tension*sin(hang angle) = 20 lbs. Rearrange the equation to get: Tension = 20/sin(hang angle). Basically, all this means is the smaller your hang angle, the more tension will be in the cables. Just to illustrate, a 180 lb person in the hammock with 8˚ hang angles would create more than 1200 lbs of tension in each cable, but at the recommended 30˚ the tension is only 360 lbs. Excellent post. Thanks for the walkthrough. Of course Hennessy hammock makes good gear but all the better when it’s done right. Ok this seems like a silly thing to have to point out, but doesn’t adding that much sag cause the tarp to be useless against anything but straight down rain? When I go camping it seems the rain comes horizontal. Doesn’t all the green you can see at 11:23 get wet? No, not silly at all. First, I need to point out that this technique is not restricted to asym tarps. The concept of attaching a tarp to the hammock suspension is what’s really interesting here. Many folks are skeptical about the minimal coverage on an asym tarp, and in some cases rightly so. I’ve been using asym tarps for years in adverse weather and can attest that they can work very well, even outside ideal, rain-coming-straight-down conditions. The video doesn’t illustrate well how the occupant will move the hammock away from the low-coverage area. That said, I’m not trying to convert anyone to minimal tarps, but rather show how to attach a tarp so it won’t sag once you get in. A hex, diamond, winter, or rectangle tarp will provide more coverage an can all be attached his way. I also used the Hennessy monsoon tarp connected directly to the suspension and it worked famously. As I’ve pointed out, the angle doesn’t need to be exactly 30-degrees, so you can get the tarp closer to the hammock if need be, but not as close as folks try with a near horizontal hammock hang. How does this change the comfort of the Hammock? I like the flat position the HH offers, does this pre-angling change the final sleep position? Nothing changes on the lay of the hammock. The ridge line helps keep everything set. I have now got at least 4 nights since my first attempt at lowering the angle of the ridgeline in which I was not quite satisfies. The good news is, I have had much better results. I was worried on my last outing when it was windy and raining but I stayed dry. I could see getting wet if I were out in the open more but the trees seemed to block the wind enough and I guess slow the rain down and redirect it so that even though windy, the rain was not getting blown in on me. I also noticed I was able to see out much better and stay cooler on some pretty hot nights. OK I tried this with my A-Sym Ultralite. It was not ideal for me. It did tighten up the fly somewhat, but it caused a ton of sag in the bug mesh. It also made the sleeping position much more like a backyard hammock — very saggy in the middle. I had to re-rig in the middle of the night. I love the comfort of this hammock but it is so much harder to set up than a tent I am about to give up. Thanks for the idea though. I do agree that a totally flat line is not good for loading forces. Is this a Hennessy hammock? If so then I would have thought the actual hammock body would still be about the same lay due to the set distance between the ends of the hammock. Yes, putting in more sag will shorten that distance a little but not much. Anyways, before you give up on hammocks you might try one more time with a little less angle. Even a 20 degree sag will help keep the fly tighter than the way I used to pull mine almost banjo string tight. Yes, it is a Hennessy. Doesn’t shortening that distance even a little cause the bug fly to sag? That was my main problem. I prefer a tighter bug fly so it does not touch me from above. I finally have resorted to a separate line for the fly. It takes the hammock out of the realm of lightweight backpacking but it really seems to be required to me. No, you aren’t shortening the ridgeline on the hammock. It remains taut and operates as normal. The only change is the angle of the suspension. I commented above about my solution of bending about a foot of shock cord to the ridge line to take up the slack when hanging at a 30⁰ angle, but not overstrain the ridge line if I hang the hammock at a tighter angle (as Hennessy seems to recommend). It does leave a diagonal fold in the bug net but keeps it out of my face. The suspension cord is strong enough for a flat hang angle, and there’s nothing magically right about 30⁰ beyond that being the angle at which the tension on each suspension line is equal to the total load—pick an angle that is steeper than the very flat angle Hennessy’s videos show but shallow enough for a comfortable sleeping position and you might be happy. OMG, I thought I was alone in my hammock hanging OCD. Never been able to sort this problem until I found the website. Well done you! I used to hang my first generation non-asym Hennessy (with a bigger fly) and very straight by passing an extension of the prusiknot through the anchorpoint and back to the fly. This made for a a selftightening fly suspension system when the hammock was loaded. would it be possible for you to take some pictures of this method? or better yet a video! You rock !!! I found your You Tube video one day before I took my 7 year daughter out on her first campout. I set up my Hennessey hammock at the campsite right next to her Scout hammock using the 30 degree angle method that you showed. Anyway, it rained so hard that night that my daughter couldn’t hear me yelling to her to stay in the hammock. But she did and both of us stayed dry. Your hanging method saved us and I am not kidding. I have used my Hennessey probably 50 times plus and have had leaked problems because I didn’t understand the reasons why. Your video was the difference and I can’t thank you enough. Thank you! This was reassuring. I’ve been reading comments of people who I don’t think watched the video and I’ve been considering making a follow-up (I still might). I’m glad it worked for you! Did you see my post on how to stay comfortable in a hammock? If you sleep diagonally you will flatten out. Much more cozy. I’ve got other tips in that post. Using the hammock as a bivy is certainly possible. I’d rather hang it up but go for it! Use trekking poles or sticks to hold up the tarp. How is the lay on the HH? Any flatter than others? I’ve been using a Treklight double hammock for a couple years but I’m considering going back to the ground unless I can find something that lays flatter. Not a fan of the kyphotic alignment, hyper extended knees, head pushed forward positioning that I get with the Treklight. I’m wondering if the asymetrical cut might make a difference? Thanks! The HH won’t help those concerns. It’s a tad smaller inside. A flatter hammock would be the warbonnet blackbird or the UK hammocks xpedition. The foot box and larger size helps a lot. For a completely flat lay, I would go with the Warbonnet ridge runner. Thanks Derek. I’ll definitely give those some thought. The ridgerunner is an interesting idea…I’ll have to compare the weight with my current setup. Johnny, to add to Dereks comments, I find that the bigger hammocks definitely lay flatter than the smaller ones. And by bigger, I mean longer, although wider helps too. I’ve tried several sizes of Hennessy Hammocks and a couple of other brands like Speer and Crazy Creek and the bigger ones always felt the most comfortable. Same for my homemade ones. I have not had the opportunity to try a Warbonnet but Derek has so I would trust his input. Derek, do you know if the HH is a right or left lay hammock, or does it matter, I’ve heard that the asym design dictates this to a degree (I am a right side sleeper due to sinus issues). The HH hammocks have a head left, feet right design. I’d have to check if they offer a flipped design but I don’t think so. Would an HH benefit from the addition of a structural ridge line? All Hennessy Hammocks have structural ridge lines. Thanks, Derek. I wasn’t clear on that point. Any plans to put on any hammocking seminars in Georgia? Hammocking is starting to catch on with my sons’ Scout troop here in Marietta. Two weekends ago my First Class and I pitched Hennessy Expeds (Classic and Zip) and my Webelos II pitched a Byer, covered by a makeshift tarp. (He’s a natural at improvising.) They’d never hammocked before but loved it. Let me know what you require and I’ll check in with the troop’s leadership. My email is box5368@gmail.com. Meanwhile, do you think the Expeds will do just fine for our upcoming mission trip to Haiti? Or should we spring for hammocks, Hennessy or otherwise, with “jungle” in their branding? If I were going to Haiti, I’d definitely bring a hammock! No question. Better air circulation, better comfort, better critter protection. If you wanted to sponsor a hammock clinic, it might be best to work with the district or council to get broader support and attendance. I only ask for travel expenses, if possible, to cover fuel, meals, etc. Great, and makes sense. I’ll make some inquiries. Do you know if this would work with a Warbonnet XLC and Superfly tarp? You can use this tarp hanging technique on any hammock and tarp, provided that the tarp is connected to the hammock suspension and that the suspension is not hyperextended. I think I see another benefit to using a prusik (or klemheist) on the non-moving side of the whoopie sling’s adjustable loop: no more pulled-through whoopie slings! I made four whoopie slings a couple of years ago, and it took just two microseconds of stupidity and carelessness to bring that number down to two. By leaving the prusik/klemheist cord in place, the adjustable loop can’t pull through. Is there something I’m missing here? Thanks for a very informative site, and for this article. I think it’s the solution for a problem I’ve been wrestling with. In order to hang in wide open spaces with trees really far apart (for breeze, sun, views, and whatnot) I use slightly unusual suspension: long lengths of static cord tied to each end of my tree straps. I throw one end up over a high branch, pull the tree strap up, and have it wrap around trunk. Then I just connect both cords to one end of my hammock. The second cord adds weight but it makes it easier to retrieve it during takedown. Anyway, the problem was how to hang a tarp, but thanks to your article, I’m just going to throw a klemheist onto my suspension. While I was lying in my hammock this morning, feeling the wet spots in my underquilt and feeling sorry for myself, I lamented that I couldn’t adjust the tarp tension while IN my hammock. But then I thought, well, why not? What if I: (1) tie a small bowline in the end one of the tarp lines and run it out to the prusik loop on my whoopie sling suspension, and then back under the fly to the center; and (2) take the other tarp line out to the prusik loop on the other whoopie sling and back under the tarp to meet the bowline in the center. Now I sit in my hammock and tension the tarp from there (running the second line through the bowline and back to a butterfly knot to get a little extra mechanical advantage). The lines will also serve as a ridge line. I’ll try it later today after the rain stops. Does anybody see any flaws in this plan? Sounds like an interesting idea! Let me know how it works and we can illustrate it. Thanks for the encouragement, Derek. So far I have discovered a gripping knot which works better for me than either the Prusik or the Klemheist. It’s the Distel knot, and I found some people on Hammock Forums talking about it. The other two knots work well on the bury part of my whoopie slings, but not a single thickness, and not two single parts side by side. I am using 3/32″ paracord on 7/64″ Amsteel with no slippage so far. I am trying to find an easy, one-handed way to tighten the tarp lines while sitting in the hammock. One idea I had was to connect the two lines together in the center using the long axis of a D carabiner. By rotating the carabiner to the short axis, the whole loop gets 2 inches shorter. The carabiner will stay in this position (I hope) because the rain fly itself will hold it in place. Will try it tonight when I camp on the local disc golf course!